The Art For Arachnoiditis Project is fiscally sponsored by the New York Foundation for the Arts, a 501(c)(3) non-profit organization. The project promotes the healing power of all genres of Art. Follow the SheilaLynnK Art Studio projects at Patreon for Announcements about this and other Studio projects. Here is a good faith estimate of the cost of project expansion in Year 2. This budget will be updated as the project evolves. AS OF Nov. 9, 2015, there are not enough funds to meet all of these goals. The YEAR 2 budget will be revised to accommodate these changes. Your tax-deductible contributions via our fiscal sponsor, The New York Foundation for the Arts, continue to expand the reach of the project. 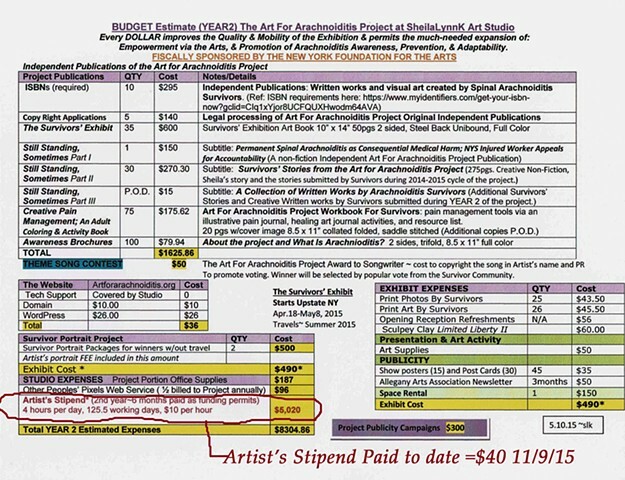 The website described in the budget is currently Active on Wordpress at Art For Arachnoiditis.org. OUR SPONSORS MAKE IT HAPPEN! Thank you! AIM|Hatchfund Campaign closed June 6, 2014. Raised $2500 to cover cost of supplies and materials for portraits and portions of the Awareness Art Exhibition. Subscribe to the Art For Arachnoiditis Project Newsletter to receive quarterly news and CURRENT updates about these numbers.